Here, today, I've got what I believe is a little treat for the AK fans out there. 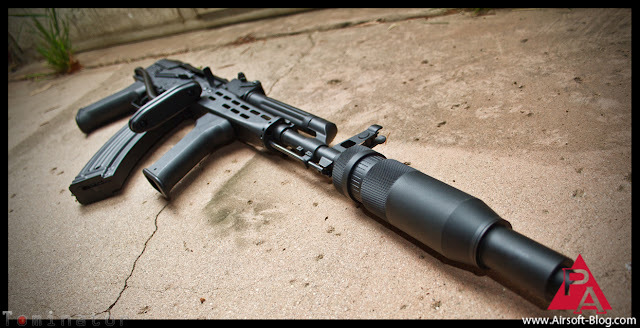 Not only do I have the new Echo1 AMD-65 Hungarian AK AEG, but I've taken the liberty of outfitting it with the new MadBull PBS-04 AK Mock Suppressor (unreleased to the public at the time of this posting). The two items, separately, look pretty awesome, but when paired together, they're downright wicked. click the link above to see the full post. I would be willing to bet that some of you reading this might not be real familiar with this particular model of AK-style rifles. I'll be honest, I'd never even heard of it until Echo1 USA unveiled it to me at their Shot Show booth this year. Therefore, I shall provide you with a brief excerpt from Wikipedia regarding the real steel version's background. So basically, it was designed for infantrymen who have to ride in vehicles, as well as paratroopers. I realize that adding that gorgeous MadBull PBS AK Suppressor on there negates a bit of its compact characteristics, but it's still got the folding stock with makes a big difference. Also, granted, the likelihood of attending an Airsoft game where I would be riding in a vehicle or jumping out of an airplane anytime soon are pretty slim, so I'm not too worried about that. 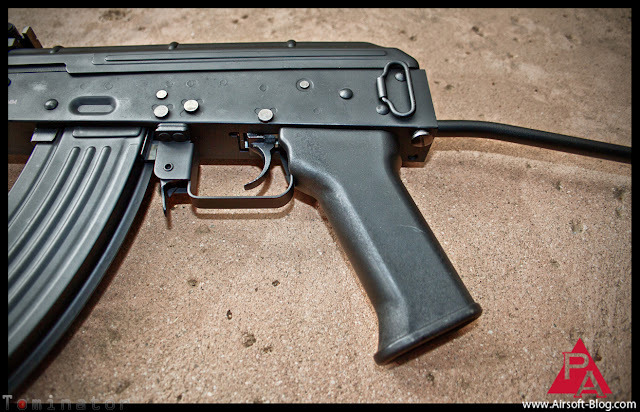 Just like its real steel counterpart, the Echo1 AMD-65 AEG has no wooden furniture like a traditional AK would have. It's a full-metal design, and I think that the manufacturer did a good job on putting this one together. 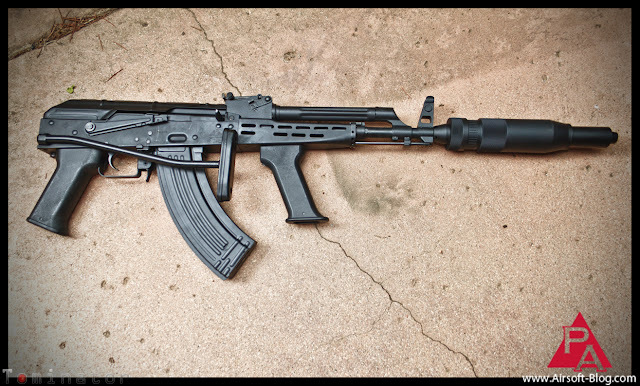 One interesting thing to note about the exterior design of the AMD-65 is the presence of the vertical fore-grip underneath handguard of the front end. I wasn't too crazy about the way it looked when I first saw this thing at Shot Show back in January. However, since then, it's grown on me, plus it's actually pretty comfortable when wielding the rifle. It's actually necessary for the vert grip to be canted forward like that because there needs to be clearance for mag reloading purposes. 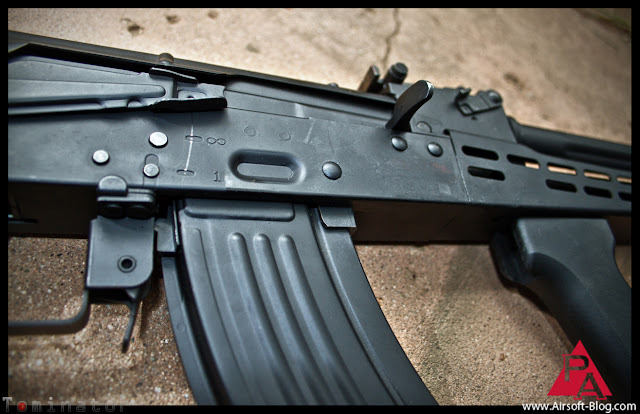 If you've ever dealt with an AK before, you'll know that when inserting or removing a magazine from the receiver, you need to have some room for the bottom of the mag to move in a front to back motion to snap into the receiver (or vice versa for removing it). 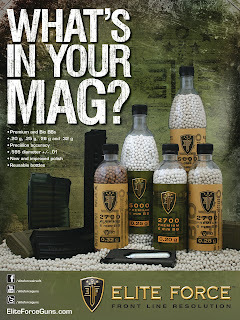 Speaking of magazines, the Echo1 AMD-65 comes with two 600-round high-capacity magazines, each featuring a speed-winder built into the side of each magazine. You can use the special tool provided in the box, or a simple allan wrench will work as well. In fact, I prefer the allan wrench because I can twirl it with my finger faster than I can hand-crank the mag using the little tool Echo1 gives you. The Echo1 AMD-65 also comes with a 9.6v 1100mah NiMH stick battery for AK rifles. Definitely a plus. Many of the guns I review usually come with a weak-sauce 8.4v battery, if one is included at all. I can tolerate a 9.6V when a LiPo is not an option, but I usually just toss the 8.4v's by the wayside. So thanks, Echo1 USA. Well played. Lastly, you'll also note in the image directly above this text, the AMD-65 features a rear sling mount for attaching your favorite one-,two-,or three-point sling mounts (there's a sling mount point on the front end of the rifle as well, just not pictured here). 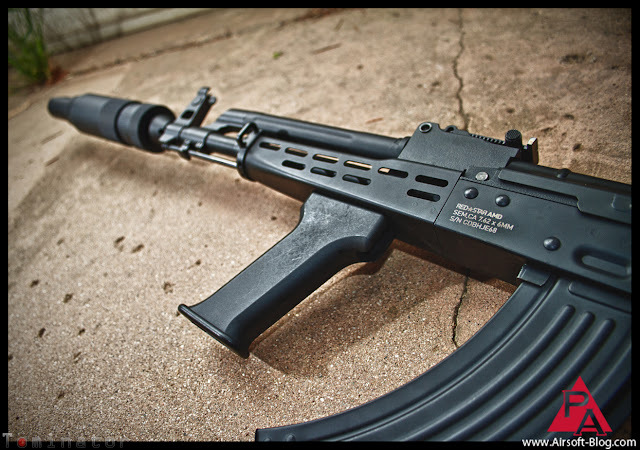 Like most Airsoft AEGs, the Echo1 AMD-65 has three-firing modes (safe, full-auto & semi-auto). Notice the order in which I listed them in? That's because the rifle switches from Safe to Full-Auto, THEN to semi-auto, unlike many other traditional design platforms. You can see in the image above, I've provided a close-up so that you can see the markings they used for this. There is actually no marking for safe-mode, but for full-auto, they went with the symbol for "infinity," and for semi-auto, they went with the number "one." So that's all for now. Performance test will come in a later blog. 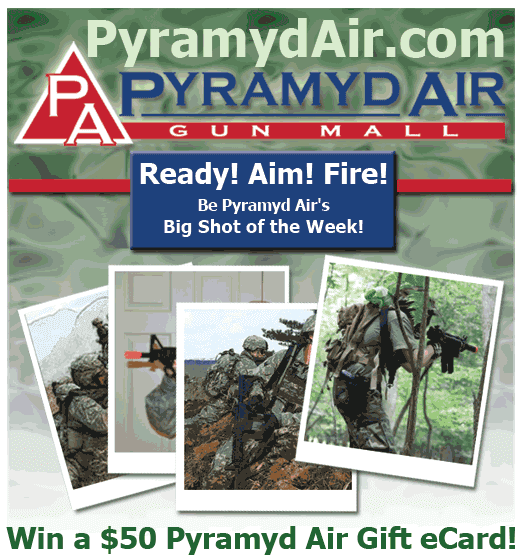 If you enjoyed the photos, please share a link to this post on your Facebook page and/or your favorite Airsoft forum. It would be greatly appreciated!